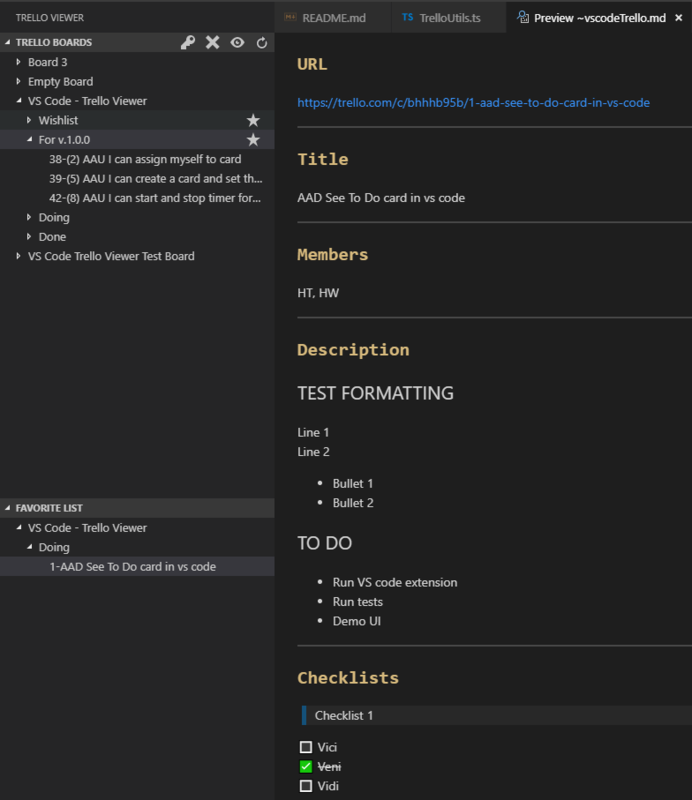 GitHub - choppedcode/vscode-trello-viewer: VS Code extension to view Trello cards, lists and boards inside of VS Code. VS Code extension to view Trello cards, lists and boards inside of VS Code. Want to be notified of new releases in choppedcode/vscode-trello-viewer? Pull request Compare This branch is 2 commits ahead of Ho-Wan:master. Browse Trello boards, lists and cards in the side bar. Add, move, or archive card. Add and remove user to card. Edit title and description of card and add comments. View selected card using the markdown previewer and open to the side. See formatted checklists and cover image for the card. Assign a favourite list to easily access cards. Saves credentials to use between sessions. Can filter to show only starred boards. Activate extension by clicking on the icon in the left Activity Bar. Set credentials by clicking the key icon in the left Side Bar or running command "Trello Viewer: Authenticate". After entering API key, a new page should open in browser to get an API token. Alternatively, use the command "Trello Viewer: Set Credentials" and follow instructions from Trello to manually generate a token. Trello boards, lists, and cards appears in left Side Bar. Clicking a board or list expands or collapses object. Clicking a card opens the markdown file as well as the previewer, opening this to the right side (editor column 2 by default). Clicking on the 'star' icon to the right of a list assigns this as your "favourite list", shown in the lower part of the side bar. Clicking on the icons in the side bar runs various commands, such as setting credentials, removing credentials, showing saved info, and refreshing views. Click the 'plus' icon to add a card to the selected list. Right click on a card to see options for card, such as assigning a user, editing the title or description, and archive card. Main functionality is provided using the VS code interface in the left Side Bar. Running commands to use this extension is optional. Trello Viewer: Set Credentials Set user Trello API key and token manually. Trello Viewer: Refresh Refresh the main Trello tree view. Trello Viewer: Reset Credentials Resets saved credentials. trelloViewer.starredBoardsOnly false Controls whether to display starred boards only or all boards. trelloViewer.viewColumn 2 Specifies which editor column markdown previewer opens at. This extension creates a temporary file named ~vscodeTrello.md in the user's VS Code Settings folder. The markdown file contains parsed content of the Trello card and can be saved locally. Hover over any board, list or card to see the Trello ID. The API token is stored using AES 256 encryption with IV. The setting "markdown.preview.breaks" is automatically set to true to see new lines correctly formatted.